Celebrating deception at the bird carving world championship. To most of the American public, chicanery is pretty gauche right now: Bernie Madoff, risky bank investments, torture memos, Blago. Yet some deception is just too ingrained in our heritage to easily dismiss. Which is why competitors from around the world recently gathered in Ocean City, Maryland to celebrate and compete in the only American art form grounded in trickery. 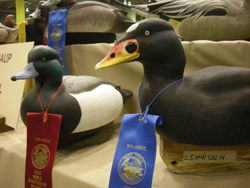 The Ward World Championship is the annual meet-up of wildfowl carvers, those artists with centuries-old ties to the decoy makers who carved birds not to decorate shelves or long tables of a small town’s convention center, but to attract and kill birds that migrated along the nation’s shores.